Garson, G. D. (2012). Variance Components Analysis. Asheboro, NC: Statistical Associates Publishers. Variance components models are a way to assess the amount of variation in a dependent variable that is associated with one or more random-effects variables. The central output is a variance components table which shows the proportion of variance attributable to a random effects variable's main effect and, optionally, the random variable's interactions with other factors. Random effects variables are categorical variables (factors) whose categories (levels) are conceived as a random sample of all categories. Examples might include grouping variables like schools in a study of students, days of the month in a marketing study, or subject id in repeated measures studies. Variance components analysis will show whether such random school-level effects, day-of-month effects, or subject effects are important or if they may be discounted. Variance components analysis usually applies to a mixed effects model - that is, one in which there are random and fixed effects, differences in either of which might account for variance in the dependent variable. There must be at least one random effects variable. To illustrate, a researcher might study time-to-promotion for a random sample of firemen in randomly selected fire stations, also looking at hours of training of the firemen. Stations would be a random effect. Training would be a fixed effect. Variance components analysis would reveal if the between-stations random effect accounted for an important or a trivial amount of the variance in time-to-promotion, based on a model which included random-effects variables, fixed-effects variables, covariates, and interactions among them. It should be noted that variance components analysis has largely been superceded by linear mixed models and generalized linear mixed models analysis. The variance components procedure is often an adjunct to these procedures. Unlike them, the variance components procedure estimates only variance components, not model regression coefficients. Variance components analysis may be seen as a more computationally efficient procedure useful for models in special designs, such as split plot, univariate repeated measures, random block, and other mixed effects designs. Note also that general linear modeling (GLM) in SPSS does also support analysis of variance associated with random effects but estimates their parameters as if they were fixed, calculating variance components based on expected mean squares. It should be noted that there is a more general use of the term "variance components" to refer to any procedure which partitions the variance of the dependent variable in any way, as is done, for example, in analysis of variance in GLM. This usage should not be confused with variance components analysis as discussed here. In contrast to GLM, the variance components procedure, like the linear mixed models procedure, uses maximum likelihood estimation to estimate these parameters. In fact, the SPSS variance components procedure supports four methods of estimation, each of which gives somewhat different estimates: analysis of variance (ANOVA), maximum likelihood (ML), restricted maximum likelihood (REML), and the minimum norm quadratic unbiased estimator (MINQUE) method. The Variance Components procedure in SPSS also contrasts in this way with the linear mixed modeling procedure, which only supports ML and REML estimation of variance components. The supported types of estimation in SAS are labeled TYPE1 (equivalent to ANOVA), ML, REML, and MIVQUE (minimum variance quadratic unbiased estimator, equivalent to MINQUE with 0 priors). The SPSS default is MINQUE with uniform priors and the SAS default is MIVQUE0; the respective defaults lead to different estimates. General linear modeling, linear mixed models, and generalized linear mixed models are treated in separate volumes of the Statistical Associates "Blue Book" series. Variance components analysis is found in SPSS under the Analyze > General Linear Model > Variance Components menu selection. 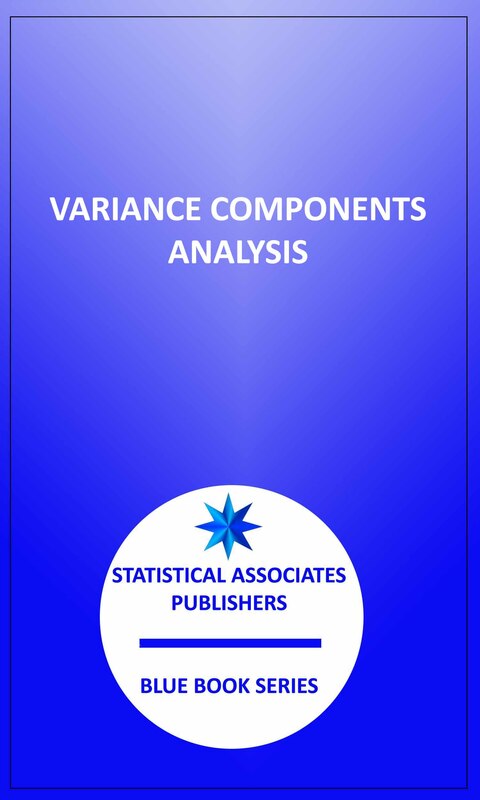 Variance components analysis in SAS is found in PROC VARCOMP.